Chiropractic is a healthcare profession that specialises in the assessment, diagnosis and treatment of conditions caused by mechanical dysfunction of joints and muscles and their effects on the nervous system which can lead to significant pain. We’ve seen and helped a wide range of people with different disorders and can offer you a very specialised and tailored service exactly for your needs. Today’s chiropractor can diagnose and treat not only backs, but also necks, shoulders, postural and gait dysfunction, arm and leg pain, and sports injuries. The human body will always do its best to maintain optimum health. However current lifestyles can place excessive strain upon it, which combined with nutritional and stress influences can prevent its ability to function “normally” and may result in common ailments and pain. Our thorough examination will help us get a proper diagnosis and develop an individualised treatment plan for conditions resulting from spinal dysfunction, poor posture, stress and injury. At the Lawlor Clinic we provide Active Release Techniques (ART®) which is a patented hands on soft tissue treatment that allows us to locate and break up scar tissue following injury. 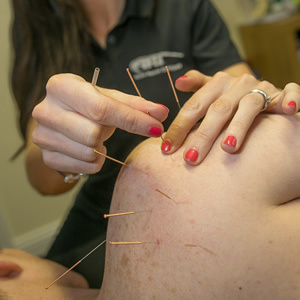 Unlike traditional acupuncture dry needling targets structures including muscles, ligaments and joint capsules that are the underlying cause of muscle and joint related conditions. This is a new approach to manual rehabilitation of the body’s movement and posture, based on the principles of how an individual’s movement develops as an infant. Instrument Assisted Soft Tissue Mobilization is a relatively new type of manual therapy that is changing the way chronic and acute soft tissue injuries are treated. What other services do our Chiropractors offer? Chiropractic treatment is designed to find and treat the root cause of the problem, not just the symptoms, providing you with long term solutions. For you this means getting back to optimal health quickly and allowing you to get on with your life. While Chiropractors are renowned for being spinal experts, our team have taken extensive post graduate courses to help with injury prevention, soft tissue injuries, rehabilitation and nutritional advice. What To Do Next – Find Out How We Can Help You? You can expect a high level of service at the Lawlor clinic; we offer friendly tailored advice, backed with many years of experience helping people like you get back to optimal health. Our team of professionals have a wealth of experience dealing with a wide range of injuries. Many of our therapies are covered by all the Major Private Health Insurers, GAA Injury Scheme, Garda Medical Aid.